If you have read my about page, then you know that this website and a few others are hosted from a 256 slice from Slicehost. Last week I discovered that if my Slice is located in the DFW (Dallas Fort Worth) datacenter that I could get free network transfer between the Slice and Cloud Files. My wallet bulged for joy at hearing this news. For the past five months I have been backing up my data to Amazon S3. Not only am I being charged $0.15/GB for storage, but I am also paying Amazon for the transfer of that data and using up my Slice bandwidth. With this new ability, I will only be paying $0.15/GB for actual file storage, thus reducing costs while at the same time freeing up server bandwidth for more important things. For example, showing you this page. Fantastic! Over the weekend I gave Cloud Files a test drive and installed the CDN Tools plugin for WordPress. Everything worked beautifully (eventually). If you take a look at the source code for any page on this website, you will notice that most images, downloads, and scripts are being served up by the Cloud Files CDN (Content Delivery Network). Having the capability of free network communication with Cloud Files, I would be stupid not to take this opportunity to improve website performance. 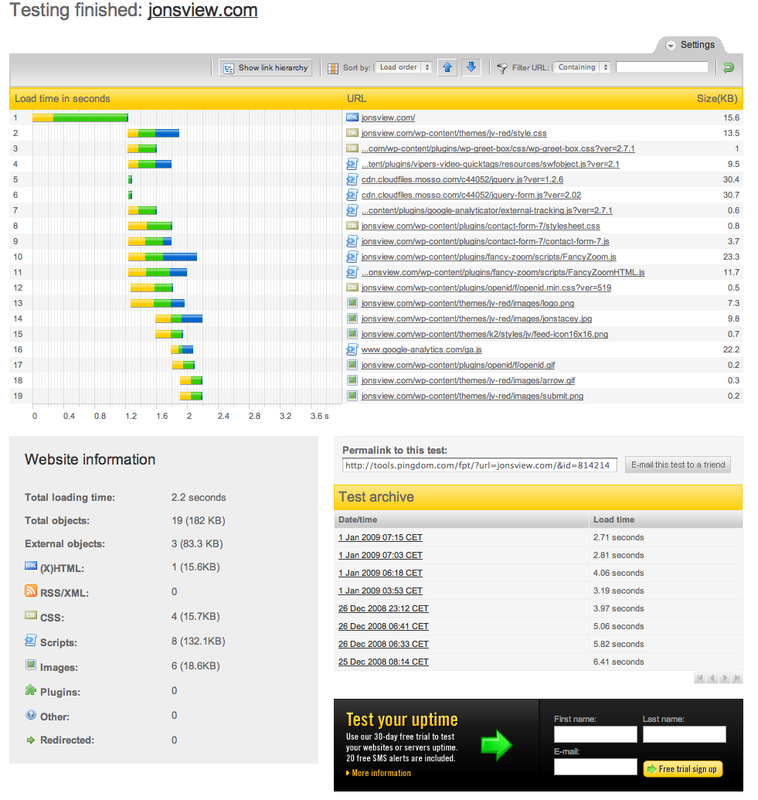 Already noticeable, my front page load time has been brought down to 2.2 seconds. The benefits will be even more visible should I offer any larger downloads or streaming media (someday … maybe). In summary, not only will I achieve less expensive backups, but I will push a substantial amount of bandwidth heavy content to more that 60 edge locations–all for less money than nighly backups cost at Amazon S3. There is only one kink–my Slice is located in St. Louis. To take advantage of this opportunity I will be setting up a new Slice from scratch in DFW and moving everything over. Expect a few bumps over the next few days while I do this. On the upside, you can expect a pretty comprehensive guide for configuring a server from scratch. Jon’s way.